The new year brings new challenges you need to face when it comes to helping your customers. Have you already made some plans on how you want to approach your customer service in 2017? One metric that you can’t go wrong with is first contact resolution. In today’s post, I’ll discuss why first contact resolution is so important, why it should be your main goal to improve it in 2017 and how you can go about doing that. First contact resolution is a customer service metric that shows you how many of your cases are handled immediately and in one touch. The goal is to have as many customers as possible coming to your website, telling you about their problem and leaving with a solution. When the first contact resolution metric is low, customers leave without receiving a solution to their problem and need to come back to you to get it fixed at a later time. This is a source of poor customer experience and lower customer satisfaction results. An example of such situation would be a customer wanting to switch to another subscription plan leaving without information on how to do that because an agent couldn’t fetch the required information. The metric is usually calculated in relation to one visit on your website, but you can also extend it to situations where a customer is transferred to another agent. This interrupts the communication and it’s bad for customer satisfaction. What’s so special about first contact resolution? For starters, it’s better than fast customer service. You can have the fastest response time in the world and still rank poorly in customer satisfaction if you need a couple contacts with a customer to solve their case. We recently measured how well different businesses are doing in terms of various customer service metrics. We paid attention to metrics like chat response time and handle time businesses using LiveChat had. Our first guess was that the fastest companies get the best customer satisfaction scores but the results were a bit different. The best-performing businesses had rather average response time (quite fast, but not the fastest we’ve seen) and a really long handle time, way longer than the average result. The companies that improved their customer satisfaction in 2016 actually increased their handle time. They’ve also sacrificed some of their response speed. Despite these slowdowns, they got the best results with 9 out of 10 customers leaving a positive rating. Check out the Customer Service Report for 2017 to learn more about our findings and about the top performing businesses. Before you can improve this metric, you first need to know what you are working with. You can start measuring first contact resolution by surveying customers after each contact. For example, when you a chat with a customer ends, you can offer a simple post-chat survey where you would ask whether they got their solution. Keep track of this metric and see how it changes week over week to get an idea what is the level of first contact resolution in your customer service. Once you have some data on your first contact resolution rate and you know what you are working with, it’s time to make some changes. Here are some methods you can use to make sure more cases are handled in one touch. Look to cases that most often end up with a delayed solution and try to root out the cause for the delay. If an agent needs to time and time again fight with the same problem (one that can’t be handled easily) see if you can do anything to get rid of that problem. This can be a website form that doesn’t really help the customer and only creates more confusion or a faulty element of your website’s store section that’s been broken for a long time and always requires a work-around. Discovering customer pain points like this will allow you to deal away with a lot of troublesome cases in one fell swoop. It’s hard to work towards better first contact resolution if agents can’t do much on their own and have to ask for a manager’s permission to do anything. For example, if agents need to ask whether they can accept a return or if a discount is acceptable in a particular situation, it will always lead to delays, interruptions in communications and lower first contact resolution rate. However, you can do it differently: let agents decide whether they can hand out a discount code or if they can accept a return. You can discuss with them which cases should apply or whether there should be a set limit for the discount, e.g. up to 10% for bigger purchases. Using these guidelines, they will be able to move cases towards a solution a lot faster. A transfer to another agent should be a last resort action for any agent. It’s better to explore all other paths before making a transfer, even if it takes longer. That’s because, from the customer’s standpoint, getting a slower but one-touch response always beats having to explain the situation all over again. There are situations where a transfer is indispensable: when only a certain expert on the team can help or when certain resources or tools are required to solve it. Keep in mind that giving access to crucial tools to a wider group of agents is another way to empower them! What a better way to start 2017 with a solid plan to improve a customer service metrics that heavily influence the satisfaction of your customers? Give it a try, start tracking your first contact resolution and try improving it to get even better results than in 2016. As always, if you’d like to add anything, feel free to share your thoughts on first contact resolution in the comments section. 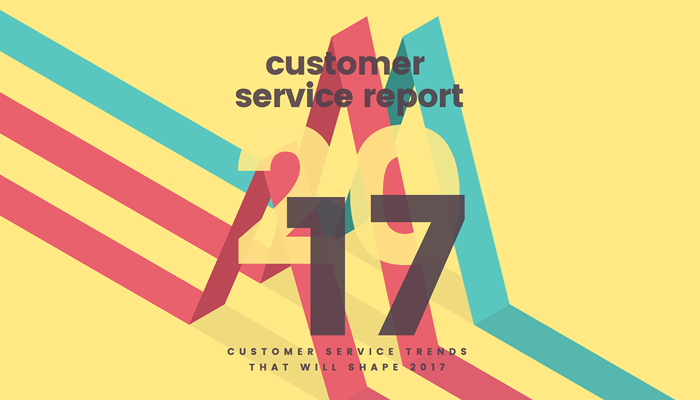 And if you’d like to learn more about what you can strive to by improving this and other customer service metrics, check out our Customer Service Report where you can read about the trends that will shape customer service in 2017. Update! The newest verstion of the Customer Service Report 2018 is available. See the new stats and experts’ advice!